1st Session of Learn To Skate is underway!!! Updated Tuesday October 2, 2018 by Brian Boisson. 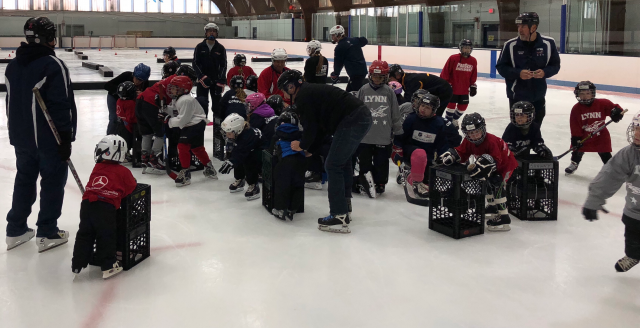 The Lynn youth Hockey Learn To Skate program (L2S) is designed for children of all ages 3-14 and is split into 3 skills levels. Children with little or NO skating experience (Beginners), Children who have just learned to balance on their own and are ready to start maneuvering around objects to get the feel for the ice (Intermediate), Children who are ready to pick up the speed a little and get more creative with their skating skills (Advanced). Sesion 1 Schedule: 12 sessions beginning Saturday 9/29/2018 through 12/22/2018. 10/6 – 10/27 – Sessions begin at 10:30am-11:40am (Due to Bruins Academy Event). 11/3 – 12/22 - beginning @ 9:30-11:40am. Cost: $125 (plus any USA Hockey fees if applicable). Equipment Needed: Hockey helmet, Elbow & Knee pads (Rollerblade,Bicyle), Skates, Hockey or warm waterproof gloves and pants.